GET A GRIP This ladder safety campaign is sponsored by The Ladder Association, in partnership with ROSPA (The Royal Society for the Prevention of Accidents). Together we are promoting the safe use of ladders and stepladders at work and at home - reducing avoidable accidents and keeping you and your family safe. 2. SELECT - The right Ladder. Does your Ladder meet the new (or previous EN131 standards? Plus, choose the type of ladder best suited to your specific task (ie stepladder, extension ladder, roof ladder). 3. CHECK - Is the Ladder safe to use? Check all rungs, stiles, tread, feet, platforms, locking bars and fixings are in good condition (not bent, damaged, worn or missing). If the ladder's dirty, clean it - damage can be hidden beneath the dirt. Dont take any risks! 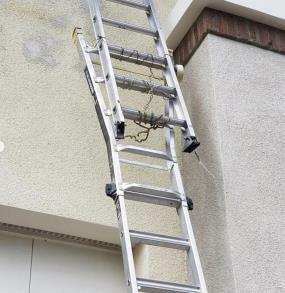 Whether you're a regular or occasional ladder user, do you really know how to use them safely?